Expect maximum strength and durability from this tempered-steel pry bar. 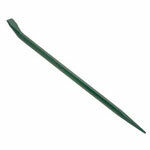 Pointed bar designed for levering and prying in tight, cramped spaces. Hex-shaped bar with pinch point makes quick work of difficult jobs. Type: Wrecking/Pry; Material(s): Heat Treated Carbon Steel; Head Width: 3/4"; Handle Type: Hex.